NextGen has more than 20 years’ experience in mapping bathymetry, water surface and bed elevation, substrate, and aquatic plant mapping in lakes, rivers, and reservoirs internationally. We pioneered the use of vertical bottom typing systems for mapping substrates in central Canada in 1996. We are among the most knowledgeable service providers of freshwater habitat information in North America. Vertical beam waveform data can be used for bottom typing. Multivariate treatment of the waveform data can be associated to, and cross-validated with, known substrate types. Supervised and unsupervised techniques can be used. Side scan sonar is complementary and applicable to relatively shallow water with hard substrates. An acoustic telemetry (VRAP) study of habitat use by Lake Whitefish was undertaken in the Experimental Lakes Area, Ontario. 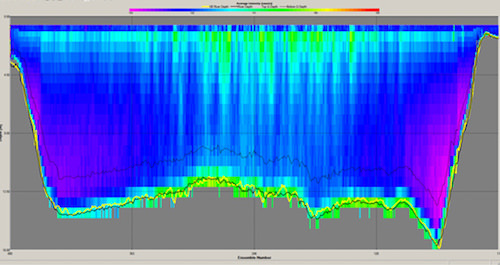 This was the first innovative use of acoustic data with substrate, depth, and temperature data in a GIS. It continues to be a frequently cited telemetry study in temperate North America..